With all of the unseasonably cold weather lately, I was really craving a casserole type dish. I had a hankering for something cheesy, and something with wild rice. Wild rice is my favorite type of rice because it has such a rich flavor. I think it does a really nice job of sprucing up any vegetables that you pair it with. The downside is that it can be hard to find, and it is typically much more expensive than other types of rice. After some thinking, I came up with this broccoli, black bean, and cheesy wild rice casserole. I added the black beans to increase the amount of protein in this dish so that it was even more satisfying. But the best part of this dish? The sauce. I used my macaroni and cheese sauce that I developed a while back, and IT. WAS. GOOD. As in, my new favorite comfort food good. 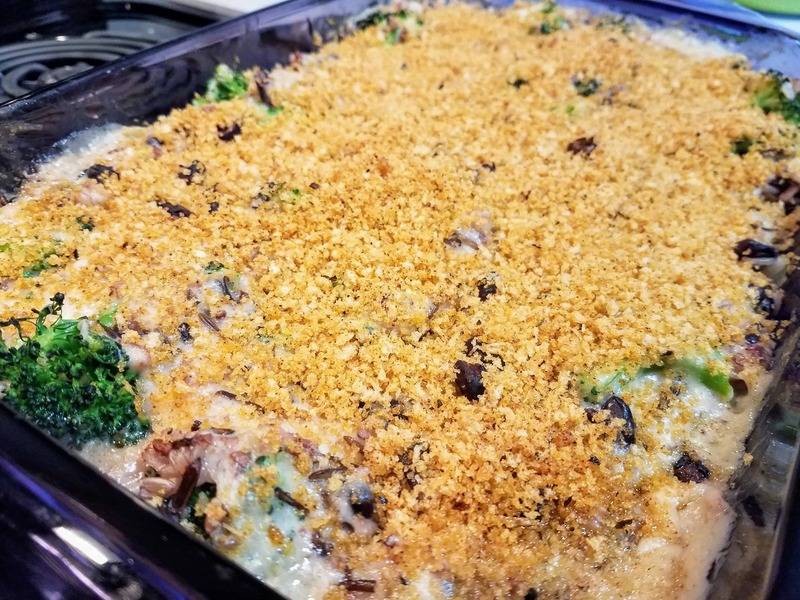 If you are looking for a comfort food that makes a ton, then you definitely need to make this broccoli, black bean, and cheesy wild rice casserole! 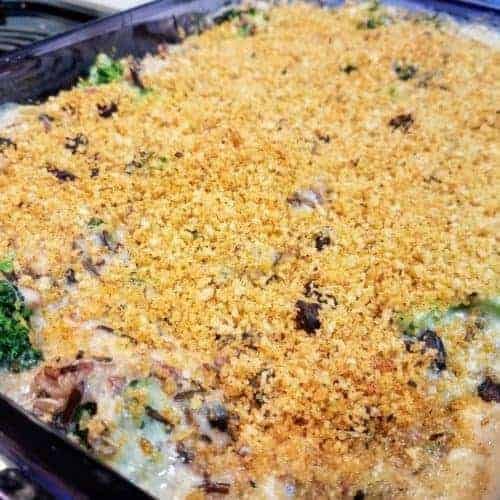 This Broccoli, Black Bean, and Cheesy Wild Rice Casserole is perfect for cold, wintry nights where you want a lot of food that is very filling. While the rice is cooking, bring a medium saucepan of water to a boil. Fill a large bowl with very cold water and ice if you have it. Boil the broccoli florets for 2 minutes. Remove with a slotted spoon and place into the bowl with ice cold water to blanch them. The florets should be bright green and crispy. Drain the water from the medium saucepan, give it a good rinse, and dry. In the saucepan, heat olive oil over medium heat until it starts to shimmer. Add onion and saute for 5 minutes, or until it becomes translucent. Add garlic, and cook for 1 minute longer, or until it becomes fragrant. Remove from heat. In a pot, melt butter over medium heat. Once the butter is melted, add the flour. Mix with a wooden spoon to form a roux. While constantly stirring, cook the roux for 3 minutes (this will eliminate the flour taste in the final dish). Add ~1/3 of the milk to the roux and mix until combined. Pour in another ~1/3 of the milk, mix until combined again. Then pour in the remaining milk and mix until everything is combined. You should end up with a thick soupy sauce. Add both cheeses to the sauce. Continue stirring over medium heat until cheese is melted. You should end up with a thick sauce. Add ground mustard and nutmeg to the sauce, stir until combined. If desired, add freshly ground Himalayan pink salt and freshly ground black pepper to taste. Add the cooked rice, blanched broccoli, onion/garlic mixture, and beans to the pot with the cheese sauce. Mix until everything is coated. Pour the mixture into a 9″ x 13″ pan, top with homemade shake and bake, cover with aluminum foil, and bake for about 20 minutes. After 20 minutes, remove aluminum foil from pan, and continue baking for another 10-15 minutes, or until the top is golden brown. Ooo, this is all my favorite things! I have made a similar casserole with chicken before but never thought to make it vegetarian using beans as the protein . . . good idea! That looks delicious! Just a question, what’s a good substitute for the beans? My kid can’t eat beans due to allergy. Would any kind of meat do? Thanks! I would recommend using cooked, shredded chicken either from a rotisserie chicken, or from some chicken that you baked in the oven. I would start off by putting in a cup of it, mix it altogether and make sure that everything is coated nice and evenly as described in step 10 above. If you still have a lot of sauce left over, you can try adding more in by 1/4 cup increments until you think you’ve added enough (I would not exceed two cups though). I generally like to err on the side of it being more soupy, because when you bake it, it condenses down a little in volume. I hope this helps and let me know how it works out! Looks very good! I’ve never tried wild rice before but I always wanted to. Will definitely print out this recipe and will try it out soon. I’ve never tried wild rice before but I always wanted to. Will print out this recipe, stick it in our fridge, and will give it a try very soon! I’m on a lookout for healthy and equally sumptuous veg recipes. With the rice, broccoli, beans and cheese, this is already making me drool. Definitely going to try this one. 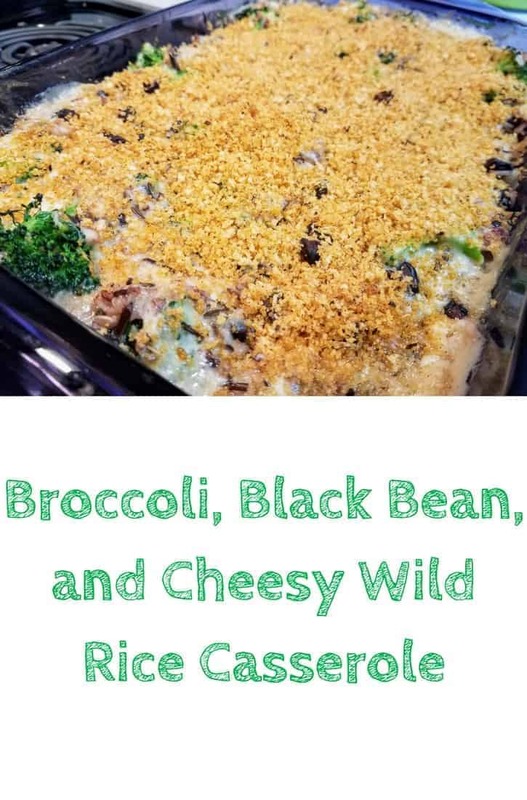 I have never tried wild rice before but I love a good casserole recipe. can’t wait to try it! Which other cheese do you recommend for this recipe besides the ones listed? So that’s a tricky question to answer, because all of the mac and cheeses I have ever made or had, have had some combination of cheddar and Parmesan. Generally speaking, the harder cheeses fair better in mac and cheese sauces than the soft ones, because the taste remains after melting and heating it so much. The only other options I can think of, would be some combination of Monterey Jack, Gouda (this might be weird with the broccoli though), Raclette, Gruyere, or Provolone. I have never played around with this, so I’m not sure what the results would be 🙂 I checked again back through my recipes, and nearly all are combinations of cheeses included either cheddar or Parmesan in the mix. If you’re up for experimenting, I would scale the sauce down and make a small batch of that first, and try it out over some broccoli. The rest of the ingredients should pair with a wide range of cheeses, but broccoli could be tricky. Let me know how it works out! Wow that sounds fabulous! I have been trying to become a vegetarian for quite a while now and recipes like yours are helping me bit by bit. Thanks ! Another five star rating for you! Although I hate eating beans, I love broccoli! I guess I’ll just have to replace them with meat.